Lest the listener get confused, the verses and the refrains do not represent the same speakers. They could be interpreted as two aspects of the same person, but they do represent ideas in tension. The lyrics are mine, but Bruce Scism made significant early contributions to the music as it emerged. 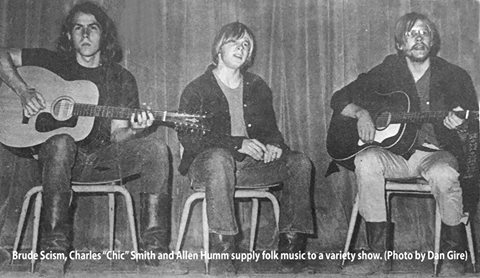 I decided to include a picture of an early performance (1971, I think) of an equally early version of this song (with my name spelled wrong).